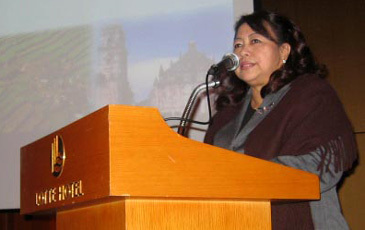 Ms. Maricon Basco-Ebron, Tourism Director of the Philippine Embassy in Seoul makes welcoming remarks at the RP tourism road show on Nov. 17, 2008. The 7th Philippine Hotels & Resorts Roadshow has wrapped up its successful promos in Busan and Seoul on Nov. 12 and 17 respectively throwing the spotlight on new activities in favorite and familiar destinations of archipelago in a different light. Organized jointly by the Philippine Department of Tourism and the national flag carrier Philippine Airlines, the two road shows were aimed at promoting RP tourism to Korean travel wholesalers in Busan and Seoul, which account for the bulk of Korea's 11.6 million outbound market. "The bigger than expected turnout at Seoul road show on Nov. 17 in particular indicates that the Philippines still remains as the most popular destination for Korean tourists despite the ongoing business slowdown in tourism sector caused by the global financial jitters," said Jin-ik Kim, president of Lotte JTB , one of the country's leading tour operators. The DoT-PAL mission comprises 45 powerhouse industry leaders such as Sofitel Philippine Plaza, Maribago Bluewater,Crowne Plaza, and Microtel Inns & Suites to name just a few. 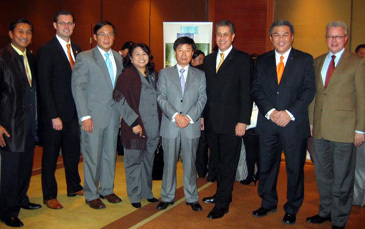 Ms. Ebron (fourth from left) and Kim Ki-Tae, president of PAL Korea (fifth from left) pose for camera with other RP delegates. The central theme of this year's presentation was the Philippines' improving investment climate and the government's initiatives in tourism infrastructure development and promotions. "Some if not most of you might be asking why a roadshow in this time of crisis? And why not? We in the Philippines convince to believe that all the financial crunch affecting the world will be temporary and that tourism will continue to grow," Ms. Maricon Basco-Ebron, tourism director and attaché at the Embassy of the Philippine in Seoul said in her welcoming address to participants to the road show in Seoul on Nov. 17, 2008. Last year, the number of visiting Koreans reached 572,133 to top the country's foreign arrivals, which totaled 2.84 million. "For this year, the target is 650,000 and we are confident of achieving that," said Ebron. The Seoul road show came after 2008 Gyeonggi International Travel Exhibition, which was held at KINTEX in Ilsan, some 20 km north of Seoul Nov, 13 -16, 2008. Philippine road show gets under way in Busan. As usual , DoT took center stage at KINTEX with the spacious 10 booths showcasing diverse tourism attractions of the archipelago, notably its newly developed adventure tourism products geared up for venturesome young travelers as well as new list of tourism attractions featuring exciting yet exotic night life, shopping and exhibition and convention business. As usual, Korean visitors to the annual tourism show were provided with upgraded service as to valuable and latest travel info about popular Philippine destinations to their satisfaction, she said. The Philippine booth occupied a total of 90 square meters (10 booth spaces) which was strategically positioned near the entrance. Participants at Busan road show.. They performed twice daily at the Philippine booth and at the Main Stage of the Exhibition Hall during the exhibition period. Kawayan's unusual brand of music and lively choreography featured a repertoire of kundimans, folk songs and contemporary music that dazzled the Korean visitors at the fair as well as those who attended the cocktail party at the end of the road show at Hotel Lotte on Nov. 17, 2008. In recognition of its outstanding musical performance, Kawayan was given the prestigious award "The Best Folklore Performance Award" by the Provincial Government of Gyeonggi and Korea Tourism Association(KTA), Joo, Hwa-Joong, president of KOTFA Co.,Ltd. said. Sofitel Philippine Plaza Manila on Manila Bay is part of the largest convention complex in the country and the only resort hotel in Manila. 609 rooms and suites, Spiral restaurant, Le Bar, 7Pecados entertainment centre, Sunset Bar with cultural shows, lagoon-shaped pool, spa and gym, 16 meeting rooms with pillarless Grand Ballroom, Harbour Garden Tent and Grand Sunset Pavilion. Le Spa and So Fit to open in June 2008. Level 2 and 3 Bay Wing under renovation until Oct 2008. Without insurance, millions of Americans simply can no longer afford to get the treatment they need in the United States. This is why these millions of US citizens will be looking at getting their medical treatments abroad; going overseas and spending dollars in the process in countries that are able to provide quality, safe and affordable health care. Such a trend is happening today. According to statistics, around 1,000 US citizens traveled abroad to get healthcare in 2007. It is projected that by year 2010, as many as 6,000 US citizens would be traveling abroad each year to get medical care. State-of-the-art technology, including imaging and surgical equipment and electronic medical records. Fast access to care; same day or next day surgeries. Waiver of deductibles, co-pays and coinsurance. JCI (Joint Commission International)-accredited and/or ISO-certified facilities. In the meantime, meeting with local travel writers on the sideline of the road show in Seoul, Ms. Margie F. Munsayac, VP-Sales and Marketing of Maribago Bluewater Beach Resort, said that her Resort offers the best of Cebu for those who seek the ideal balance of creature comforts and nature's wonders. "Located about 15 minutes away from the Mactan Cebu International Airport, Maribago has pride of place on the island's prized beach. All the diverse pleasures of island living are at your doorstep. scuba diving, snorkeling, beach combing, swimming or just simply lazing under the tropical sun," she explained adding that Maribago Bluewater is the perfect seaside haven for refreshing body and soul "whatever you want to do." 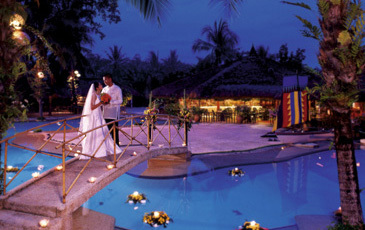 Maribago Bluewater Beach Resort is located on Mactan Island, a palm fringed Paradise only minutes away from Cebu. Bluewater is just a 15 minute drive from the Mactan Cebu International Airport. Daily flights from most Asian capitals, Manila and many provincial cities and towns make getting to Bluewater a relaxing start to dream vacation of tourists from Korea and elsewhere in the world, she added..
Budget hotel chain Microtel Inns & Suites is planninoyg to build in General Santos City a 50-room hotel to a tune of P90 million, according to Roy B. Martin, a senior official of the company. "Construction is targeted to start by the first quarter of 2009." he said disclosing that his company and Floirendo-owned Damosa Land Inc. are in talks to open a branch in General Santos City, which would be the second in Mindanao. Damosa holds the Microtel Inns & Suites franchise in Davao City and in this locality. Damosa [management] are in the advance stage of negotiations.The proposed Microtel site is reportedly along the national highway fronting St. Elizabeth hospital. The building at the proposed site has been cleared of its occupants such as a convenience store, a bakeshop and a drugstore. This locality, which in the last few years has attracted national gatherings, has been experiencing difficulties in accommodating conventions with more than 2,500 participants even with the city's home stay program, according to Roy B. Martin. The possible entry of Microtel is also expected to boost the tourism industry of this city as existing hotel operators welcomed the development. 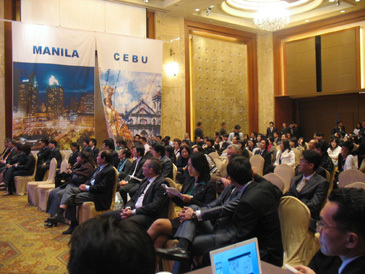 "We welcome new hotel operators since it would mean additional venues where tourists can be accommodated and for the city to further attract large summits," he quoted Romeo Bartolome, general manager of East Asia Royale Hotel as having said..
East Asia Royale, which has 100 rooms, is the undisputed hotel choice of foreigners coming in the city. Microtel has over 300 branches worldwide. In the Philippines, it operates in Baguio, Batangas, Boracay, Cabanatuan, Cavite, Mactan and Tarlac.